The vidian canal (VC), a bony tunnel in which the vidian artery and vidian nerve pass, has been widely known as an important landmark to identify the anterior genu of the petrous segment of the internal carotid artery (AGPCA) especially during lateral extended endoscopic endonasal approachs (LEEEAs). Adin et al., from the Department of Radiology, Tatvan Can Hospital, Bitlis, Department of Radiology, Dicle University, Diyarbakır, Turkey and Division of Neuroradiology, Russel H. Morgan Department of Radiology, Johns Hopkins Hospital, reviewed skull base computed tomographic images of 640 consecutive subjects. 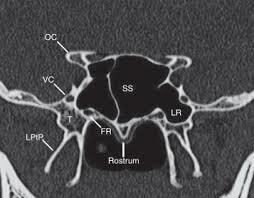 Studies were analyzed in axial, coronal and sagittal planes. The mean (±SD) length of the vidian canal was 15.4 ± 2.0 mm in female subjects and 16.6 ± 1.7 mm in male subjects, and the difference between genders was statistically significant (P < 0.001). The most common rostral-caudal course of the vidian canal was medial to lateral and was followed by the straight course, tortuous course, and lateral-to-medial course. The frequency of pneumatization pattern from most common to least common was types 0, III, II and I. Of 342 evaluated sides, the vidian canal was located below the level of the anterior genu of petrous ICA in 303 (89%) sides, at same level with the anterior genu of petrous ICA in twenty-five(7%) sides, and above the level of the anterior genu of petrous ICA in fourteen(4.1%) sides. The objectives of a study in the Japanese population are to describe the radiological anatomic features and relationships between VC and its surrounding structures, and discuss the clinical implications. Mato et al studied 231 high-resolution computed tomography (CT) scans with a slice thickness of 0.5 mm. All the patients had known sellar or parasellar pathologies but without any involvement of VC. The following VC-related parameters were examined: its length, relationship to AGPCA, course from the pterygopalatine fossa to the carotid canal, its position relative to the medial pterygoid plate and pneumatization pattern of the sphenoid sinus. Mean length of VC is 14.6 mm. There is more tendency of straight-running VC compared to other populations. VC locates infero-lateral to AGPCA in all the cases. The protrusion of VC and the paraclival carotid artery to the sphenoid sinus, as well as well-pneumatization of the sinus is also observed more frequently in almost a half of the population. Surgeons who perform LEEEAs in Japanese patients must know these anatomical features. The characteristics particular to Japanese populations may facilitate better identification of VC and exposure to AGPCA intraoperatively 2). Adin ME, Ozmen CA, Aygun N. Utility of the Vidian Canal in Endoscopic Skull Base Surgery: Detailed Anatomy and Relationship to the Internal Carotid Artery. World Neurosurg. 2019 Jan;121:e140-e146. doi: 10.1016/j.wneu.2018.09.048. Epub 2018 Sep 18. PubMed PMID: 30240854. Mato D, Yokota H, Hirono S, Martino J, Saeki N. The vidian canal: radiological features in Japanese population and clinical implications. Neurol Med Chir (Tokyo). 2015;55(1):71-6. doi: 10.2176/nmc.oa.2014-0173. Epub 2014 Dec 20. PubMed PMID: 25744352; PubMed Central PMCID: PMC4533395.